We arrived at the airport around 10:30am for our 1pm flight. The nearest entrance to Turkish Airlines check in counters is P9 although the terminal is not really that big in case your taxi drives you a little further to the other end. There were 3 check-in desks opened and the last one to the right was for business class passengers. There was a big family being helped when we arrived although they were done within a few minutes. We were given our boarding passes all the way to Tallinn and we also got our lounge invitation card. After clearing immigration control and security, we headed to the Copa Club. Just like our first visit here last year, it was very crowded although it eventually emptied about 20 minutes before we left for the departure gate. Boarding started at 12:10pm beginning with those flying in business class. There were already 5 passengers (from Bogota) when we boarded and in the end, we were 15 passengers heading to Istanbul that day. The business class cabin is arranged from rows 1-3 in a 2-2-2 configuration with a total of 18 seats. 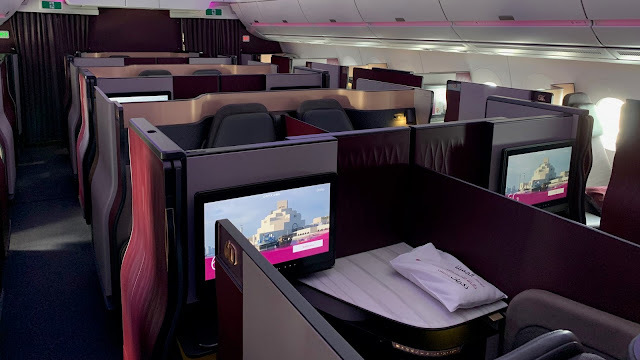 Aside from the cabin not having so many seats unlike on their Boeing 777s with a 2-3-2 configuration, the seats here are also lie-flat which is perfect for such a long flight. My seat, 3A is a window. I have flown on this aircraft and have written detailed reviews of the seats on my recent post so I'll just concentrate more on the service here. Moments after settling in, we were offered some welcome drinks. I settled for a glass of water while Mike had the Limonata. About 10 minutes later, the inflight chef came to offer the menu (in Spanish too) and beverage list as well as a Turkish Airlines pen. Fifteen minutes later, boarding was completed and the flight attendants started offering newspapers, amenity kits and headphones. The amenity kit on this flight consisted of the usual socks, eye shades and toothpaste plus a Bentley pouch bag with a Bentley Infinite body lotion and lip balm. Normally, the slippers are already at the seat but mine did not have them. The flight attendant was quick enough to notice it though and offered me a pair of them. The headphones are from DENON just like on my previous flights with them. It's not BOSE but still okay. Moments later, the inflight chef took our main course order and collected the breakfast card which we had filled up. The captain came on the PA and gave us some flight informations including our flight time of 12 hours and 20 minutes which is much shorter than our expected time flight of 13 hours and 5 minutes. Pushback was at 12:41 where the in-flight safety video was played as well. We had a smooth take off a minute before 1pm on a semi-cloudy day. The lunch/dinner service started with the flight attendants offering hot towels on a ceramic tray. This is the first time I've seen it so I mentioned it to the flight attendant which she was glad to confirm. I know Turkish Airlines was a candidate in getting the 5 stars rating from Skytrax last year but did not get it so I guess they are not stopping until they get it. 😉 Of course, there are just a lot of things to consider in obtaining that most coveted rating. About 20 minutes after take off, drinks order were taken and I had a glass of apple juice while Mike had a glass of champagne served with mixed nuts. Another 20 minutes later, my table was set up with the usual gray table cloth, condiments tray and cutlery. There were lots of desserts to choose from but Mike and I agreed to have the Sacher Cake which was perfect. To end the meal service, I had a cup of green tea. The meal service was very efficient and which I liked since it gives the passengers more time to relax and sleep. After the meal service, the flight attendants started asking if we wanted our beds to be made. We also got a bottled water, as usual. There are two lavatories, both of which are located in the rear of the cabin. The usual Molton Brown products were there to enjoy. The onboard snacks bar had fruits, chocolate bars and Pringles among other things. For those who were awake, the inflight chef offered some open faced sandwiches which were the same sandwiches we got on the Bogota to Panama flight. Bread were also offered although there was no place to put them .... except on the table cloth. For my main course, I had the Mozzarella and Tomato Omelette which was good. Around 8:22am, the captain was back on the PA to give us updated flight informations and that we expect to land at 9:05am with the current weather in Istanbul of 8 degrees. We landed at Istanbul Airport at 8:57am although by the time we reached our "remote stand", it was already 9:12am. It looks like Turkish Airlines really need a new airport since it's often that aircraft had to be in a remote stand based on my experiences with them. There it was, another great flight in Turkish Airlines business class 😍 It was obvious that the flight attendants were more enthusiastic and engaging, probably a sign they are really aiming to get the 5 star rating on Skytrax. The hot towels being offered on a plate was also quite surprising, and which reminded me of Qatar Airways since as far as I know, they are one of few airlines doing that service. I wonder if Turkish Airlines would in the future also offer pajamas on night flights, just like Qatar Airways 😉As usual, the dining experience is perfect with the DO&CO Catering taking care of it. Overall, I really enjoyed this flight and will definitely fly Turkish Airlines in business class again, especially if the price is reasonable.